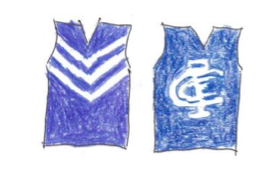 The mission for Carlton was straightforward as they travelled west to meet the Dockers; they had to win, then beat Brisbane next week, if they were to entertain any Grand Final hopes. It was apparent early on that step one in this process was going to be a problem. Freo took the ball forward from the opening bounce and assumed permanent residence in their front half. Stacey Barr kicked their first after three Blue defenders ran themselves under a floating kick. Lara Filocamo and Kara Donnellan promptly followed suit to set Carlton alarm bells ringing. The Blues could not manage two consecutive clean possessions, and couldn’t get much past the centre of the ground. It took until the last two minutes of the term to finally manufacture a shot on goal. Even then, Darcy Vescio kicked wide from 15 metres out, comfortably her worst miss of the season. The score line read 18-2 at the first break. Darcy made amends early in term two, and was quickly followed by Lake Wendouree’s own Jordan Ivey, in her Carlton debut. Just as the Blues had established some momentum, Bri Davey uncharacteristically fell afoul of the umpires. Frustrated, she gobbed off after a free on the wing and conceded 50 metres. Soon after, she was caught for a slight infringement on Ebony Antonio right in front of goal. The resultant Freo goal restored some breathing space, though Darcy quickly dribbled through her 2nd goal from an advantage free. Even though Carlton had a much better quarter, Freo still looked to be the side creating space through the midfield. They led by 4 points as everyone headed to the air conditioning at the half. Freo began the third term as they’d begun the first. Gemma Houghton clunked a great grab, but hung her shot out to the right. Then Amy Lavell missed from close in. Carlton crucially lost Danielle Hardiman, her ankle buckling while tackled in the act of kicking. Freo continued to pepper the goals unsuccessfully. The pressure started to tell on the visitor’s defence. Davey stepped on the line while kicking out. Then Sarah Hosking kicked out straight to Houghton, who didn’t miss this time. Darcy replied with her 3rd from a free kick, but that was a rare Carlton forward sortie. They trailed by 8 at the final break, with the momentum of play not favouring them. Heat fatigue loomed large as the final term descended into a roving maul. Try as they might, the Blues just couldn’t break free of the Dockers’ numbers at the ball. With limited time-on, it suited the hosts to just lock it down and watch the clock dwindle. Carlton’s red faces weren’t just from the heat, but from the frustration of a season slipping away. Freo skipper Kara Donnellan had been far and away the game’s dominant player. When she goaled from a rare fast break, the margin was only 14 points with seven minutes to go, but the die seemed well cast. Carlton’s defence had to press up in desperation, and Freo really should have had another couple of majors. Carlton couldn’t even get inside 50, let alone produce a shot on goal. By the end, there was no argument as to who had been the better team on the day. Once again, Carlton had been beaten on the spread by an opposition midfield group. The Blues’ midfield group have worked best in the clinches, but found it difficult to cover the elite opposition mids on the outside. Rather, they sought to recover the ball across half back and rebound with quick ball movement. As injury and attrition weakened the back six, so has their ability to rebound diminished. Their depth was finally shown up in this game. Donnellan deserved five votes for her 24 disposals, 8 tackles and 2 goals. Former basketballers Antonio and Houghton were versatile and difficult to match up. Alicia Janz, in only her second match, held her own in a solo ruck effort, and competed well on the ground. Freo had more disposals, and also laid twice as many tackles. Bri Davey was again being our leading possession winner, though she won’t regard this as one of her best games. Darcy did well to conjure 3 goals from extremely limited opportunities. Alison Downie performed well in defence, filling in once Hardiman went down. But the marking potential of Jakobsson, Ayre and Shierlaw was completely negated. The Blues only pulled down 2 inside-50 marks for the game. Fremantle had the better of last week’s encounter with Collingwood everywhere but the scoreboard. Only an inability to convert in front of goal had prevented them winning before now. On this form, Melbourne wouldn’t want to take them for granted next week. After such a glorious start to their campaign, it must have been deflating for Carlton to see their chances snuffed out on the other side of the continent, in front of banks of empty seats. They have one more chance to make a statement against the unbeaten Brisbane. Again, it must be stated that it was a shame these teams had to play at such an absurd time, in front an undeclared but sparse crowd. When the AFL schedule a game in the middle of a work afternoon, they are selling both the players and the fans short. Great stuff John, agree about the timeslot, bizarre and not befitting a match where a grand final spot was still technically on the line. Thought it was a disappointing end really, they promised so much more! And that Vescio shot from 15 out – knew they were in trouble then! I think the scheduling clearly reflects that the AFL had a bet each way on this first year of the women’s’ comp. It looks like they didn’t entirely trust their own marketing and commercial clout. Right from the first game’s original venue, they’ve underestimated what they were dealing with.